what other signs you would look for? 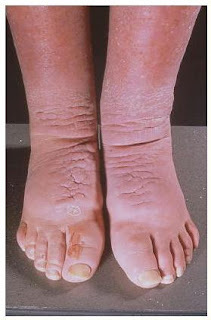 elevated symetrical skin lesions over the anterior aspect of the shins wich has orange pealing appearance. pretibial myxedema,it is a feature of Graves disease,so should look for:ophthamoplagia,thyroid acropachy(clubbing,swallon fingers,periosteal new bone formation). May be hypo/eu/hyper at time!